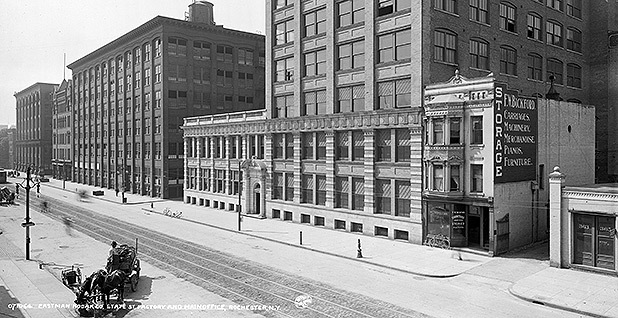 The Eastman Kodak factory and main office in Rochester, N.Y., circa 1910. Some of Kodak's old building space is being used by Energy Materials Corp. to develop perovskite technology. Photo by Detroit Publishing Co., courtesy of Wikipedia. After a 170-year delay, the discovery of a strange, metallic-looking rock found in the Ural Mountains in Russia in 1839 has ignited a global technology race for a cheaper, more efficient solar cell. It could seriously disrupt the world's solar market, currently dominated by China. The features of the rock led to the understanding that there was not a particular mineral involved, but a class of minerals that share a common crystalline structure of cubes and diamondlike shapes. The structure was named for Lev Perovski, a Russian mineral expert who first studied it. He died in 1856. Later, researchers found that mineral deposits containing perovskite structures were cheap and abundant throughout the world. But scientists weren't sure what to do with them until 2009, when a Japanese researcher found that perovskite could absorb sunlight and turn it into electricity. It was remarkably similar to prepared silicon cells. Only perovskite cells selected stronger photons of sunlight and promised to be much cheaper to prepare than silicon cells, which require 14 steps to manufacture, including preparations requiring the use of high heat, expensive automation and clean rooms. The potentially cheaper cost of materials and manufacturing has led to a first wave of commercial perovskite ventures, including at least two that are forming in the United States. They are aiming for products that could challenge China's dominance of the global solar market and help spread manufacturing around the world. "It's amazing how fast this has come along," said Matthew Beard, a chemist and senior scientist at the National Renewable Energy Laboratory in Golden, Colo., one of at least 20 research centers and universities around the world that are working with perovskite. He said that while experimenters are still wrestling with a stability problem in perovskite solar cells that, so far, has given them a shorter life span than silicon-based solar cells, there are ways to overcome that. Beard and other NREL researchers think the new crystalline materials could be the basis for a more competitive U.S. industry and the jobs that come with it. Currently, the solar industry in the U.S. — which invented solar-powered photovoltaic (PV) electricity — generates 73,000 American jobs, according to NREL, and its hiring rate is growing 17 times faster than the U.S. economy. But China, after a six-year financial sprint to provide lavish government subsidies to its solar market and its industries, remains way out in front. Its silicon-based solar products have become cheap and reliable enough to control 70 percent of the world's trade in solar modules. Meanwhile, the United States produces about 1 percent, according to a new study by Stanford University (Climatewire, March 22). The study also noted that the perovskite solar cell "has captured enormous interest among solar researchers over the past four years," and that its efficiency in making electricity from the energy in sunlight — based on laboratory experiments — had soared from 15 percent to over 22 percent in just three years, reaching a level that is competitive with modules made by China. In an interview with E&E News, NREL's Beard said one "critical factor" in this looming market shake-up "is the potential to be cheaper than silicon." Another, he noted, was that chemists, like himself, see many potential ways to tune perovskite cells to higher levels of efficiency. A third emerging factor, being developed by researchers from Stanford University and elsewhere, is the use of perovskite cells to work in "tandem" with commercial silicon cells, mating them together to quickly raise their efficiency. Perhaps the most ambitious U.S. commercial perovskite venture is growing out of machinery originally developed by Eastman Kodak — to coat photographic film with thin coatings that spun out miles of celluloid film that were sensitive to light. The high speed "roll-to-roll" printing technology that Kodak pioneered to dominate the world's photographic film market is being used by a company to coat plastic films with a thin layer of perovskite-based materials. Once his company determined in a garagelike laboratory that perovskite-based cells would work, Stephan DeLuca, the president and CEO of Energy Materials Corp., located it in Rochester, N.Y., at Eastman Business Park, formerly Kodak Park, where startup companies are using former Kodak production facilities and buildings to develop new products. Kodak once employed 15,000 people there. DeLuca's company has access to its machines to develop a manufacturing process to make the most common solar product, which is the square solar modules that are installed on rooftops of homes, stores and industrial rooftops. 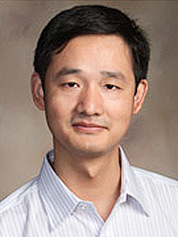 University of Nebraska associate professor of mechanical and materials handling Jinsong Huang. Photo courtesy of the University of Nebraska. As DeLuca explained it, the machinery will speed up the process of making the basic perovskite material for turning sunlight into electricity. It would then be given a protective covering of glass and encapsulated to protect against water and other substances. "What I would say is that if you make them correctly, they are stable," he said, noting that silicon-based solar modules also have to be carefully made and protected. "You have to be concerned about interactions with other materials." DeLuca said that as far as he knows, no companies have begun the commercial process of using perovskite to make modules in large quantities. "We're not there yet, but we're in the process of scaling up." But he is hopeful because "the equipment that you need is much cheaper than what you need for silicon. That will make the cost per watt much lower." DeLuca's company has developed the process with Jinsong Huang, an associate professor of mechanical and materials handling at the University of Nebraska. Huang leads a team of researchers who are developing the low-cost fabrication techniques for perovskite modules. Huang, who has received grants from the Department of Energy and the National Science Foundation, explained that his ultimate goal is not to compete with silicon modules, but to make a product that is cheap enough to compete with fossil fuels such as coal and natural gas. "Silicon is too expensive to compete with fossil fuels and coal," he recently told Nebraska Today, which is published by the University of Nebraska. "Before solar cells can be broadly adopted, we need to drive the cost down by half to be competitive with other sources of energy." Huang, who is moving his research effort to the University of North Carolina, estimated that continued development could raise the efficiency level of perovskite-coated films to 25 percent "within three to five years." A second U.S. commercial venture was spun out of Stanford University's laboratories last summer. It is called Iris PV, and its managing director, Colin Bailie, thinks his company can get to higher solar efficiency more quickly by mating perovskite solar cells with standard silicon cells. Working in tandem, the two devices can extract more power from sunlight. An Australian laboratory recently announced that such an array reached 26.4 percent efficiency. Jumping from below 10 percent to that level of efficiency in seven years, he explains, has made perovskite the fastest-improving photovoltaic technology in history. "It's certainly up there pretty close to what the best silicon can possibly do," said Bailie, who is developing a business model aimed at using tandem modules as a road to cheaper solar energy. 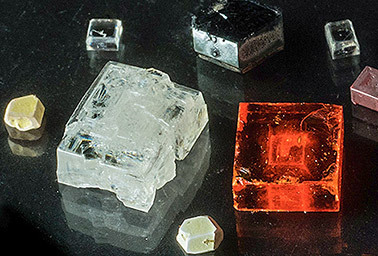 Different kinds of perovskite crystals are seen in a Department of Energy laboratory. Photo courtesy of the National Renewable Energy Laboratory. By making perovskite cells in his laboratory, he hopes to produce a line of smaller, niche products, such as tandem solar cells to power satellites and to respond to the U.S. military need for smaller, lighter power generating systems in the field. If that venture works, Iris PV aims to reshape the solar module industry by buying cheap commercial silicon solar cells made for modules that are currently being installed on rooftops. The company would complete the modules by inserting a second layer of perovskite material, a thin coating printed on a glass panel that would serve as the outside capsule for a tandem solar cell. The two layers, working together, Bailie believes, will compete with the most efficient silicon cells on the commercial market for a small fraction of their cost. The finished product, packaged together at a small, relatively simple module factory located near where the modules would be installed, would be a "win-win" proposition. As Bailie explained, they would help solar module manufacturers compete with fossil fuels, give panel installers cheaper products to sell, and help spread the growing solar industry in the U.S. and around the world. "That's our long-term vision," Bailie said. There are other players who share similar perovskite-powered visions of a global solar electricity businesses. One of them is Oxford Photovoltaics Ltd., a company spun off from the University of Oxford in England that has recently made an agreement with a solar panel manufacturer to open a commercial facility for making perovskite-powered solar panels in Germany. The venture has attracted financial backing from Statoil Energy Ventures, a subsidiary of Norway's Statoil ASA, which is one of the largest oil and gas producers in the world. Gareth Burns, managing director of the subsidiary, said the company wants to supplement its oil and gas portfolio with "profitable renewable energy." In a press statement, he described the venture as "a great opportunity to be part of a technology development that has the potential to impact the next generation of solar cells."